Split Loom | Cable & Wire Duct | Wire Trough Split Loom | Cal Fasteners, Inc.
Cal Fasteners stocks split loom ducting to hold and protect bundled wires, cables, harnesses, and hoses in wire troughs and other similar applications. Designed for quick and easy installation, with slit opening that close automatically after installation. Multiple diameters are available to meet your needs. Durable, high impact polyethylene material provides good flexibility and high chemical resistance. 0.013” heavy duty wall thickness provides outstanding resistance to abrasion and vibration. 85°C continuous rating. ROHS compliant. 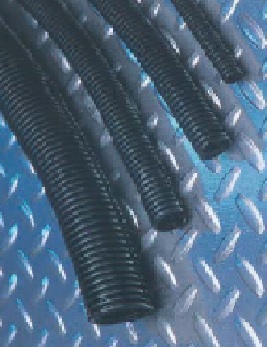 Request a quote on split loom ducts, or contact Cal Fasteners to learn more.